Documentary Screening & Discussion: "Occupy, Resist, Produce - Scop Ti"
Scop Ti is located in the small town Gémenos near Marseille, in Southern France. The plant belonged to Lipton (Unilever) and produced herbal and fruit teas and the 120-year-old local French black tea brand Thé de l’Éléphant. In September 2010 Unilever decided to relocate production and machines to Poland, closed the plant and left 182 workers without their jobs. The workers immediately occupied their workplace, supported by the union CGT. Initially all 182 workers participated in the occupation; after three years 76 were still active. They demanded from Unilever to get the factory, the machines and the brand name Thé de l’Éléphant. They planned to build a cooperative, switch production to natural and organic herbal teas using mainly regional products. The struggle of Fralib relied on production, public protest, a solidarity campaign, and the legal struggle against Unilever. Several times the workers achieved that the courts invalidated the Unilever plans of officially closing the factory and transnational corporation’s insufficient social plans. More legal struggles followed to get the salaries paid. At the end of May 2014 Unilever and the workers reached an agreement. Unilever agreed to hand over the plant and the machines to the workers; moreover it paid a huge financial compensation enabling the workers to build their own cooperative and restart production. In May 2015 Ex-Fralib reopened as the cooperative “Scop Ti”. 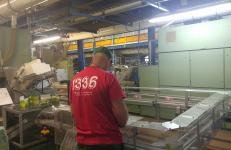 The main brand is “1336,” referring to the number of days the workers’ struggle lasted. Today, 41 workers of Scop Ti produce 16 different natural herb and fruit teas, and several organic teas. The factory is selfmanaged democratically by the workers. Existing wage differences were eliminated almost completely (the wage gap between workers and supervisors is now only 70 euros a month). In “Occupy, Resist, Produce – Scop Ti” the workers tell the story of their collective struggle and speak about their democratic organization of work. They describe the difficulties and contradictions of trying to keep up a huge industrial production and sticking at the same time to their values and principles based on solidarity, natural flavors and organic production and the collaboration with local and regional producers. The film is the fourth in a series of short films on occupations of workplaces and production under workers' control in Europe, “Occupy, Resist, Produce”, the filmmakers launched in 2014.